2014 was a year to note for Desiderata and her competitive crew. The classic yacht excelled in the big seas and strong winds that characterised the racing during this regatta. The conditions were perfect, and “Desi” surpassed herself proving to all that she is an ocean racing yacht to contend with. Tommy Patterson, manager of Antigua Yacht Club Marina, skilfully manned the helm steering her to success. Desiderata won 1st in class and 1st in fleet. Alongside Tommy, the competitive crew, with big smiles on their faces, worked diligently to gain three guns out of a possible four. Stuart and Julia led the mixed crew, who ranged from novice through to experienced racers. The brisk tradewinds ensured on-water thrills for the team and the salt-encrusted crew stepped off “Desi” each day drenched but beaming. Antigua holds one of the best classic yacht regattas, not just for the courses and conditions, but for the camaraderie and sheer fun of it all. 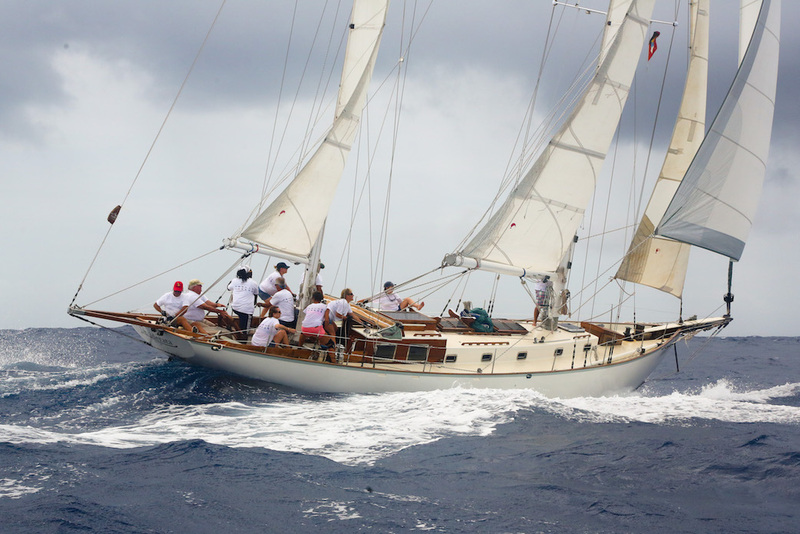 See more photos from Antigua Classic Yacht Regatta here. John Alden would be proud to see his Malabar XIII design still making waves on the regatta circuit today. 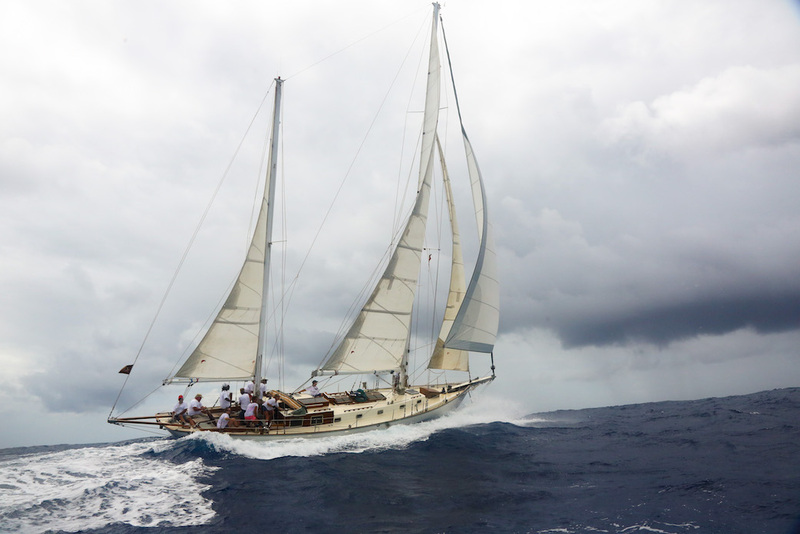 Next up for Desiderata and her lucky crew… the Panerai Transat Classique 2015! There are only two crew places left available so get in touch with Stuart and Julia today to ensure your place on the fun loving team. Images courtesy of Tim Wright and Jason Pickering. 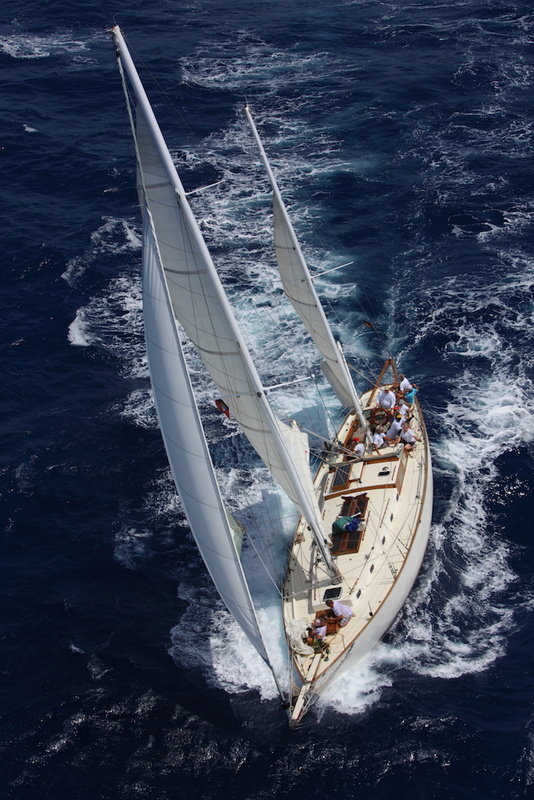 This entry was posted in caribbean, regatta and tagged antigua classic yacht regatta 2014, caribbean classic yacht regatta on November 23, 2014 by sydesiderata. There were hundreds of smiling faces in Falmouth Harbour this morning. The 27th Edition of the Antigua Classic Yacht Regatta kicked off in glorious Caribbean weather, 20 knots of warm Trades’ and two metre seas provided exciting conditions for the wondrous fleet of classic yachts that have gathered in Antigua. The Old Road Course had plenty of reaching legs, with beautiful yachts sailing fast, sliding down Caribbean surf, it was a fantastic day on the water. The Vintage Classic Fleet produced some of the closest racing today. In Class A, Scott Franz’s American 72′ Herreshoff, Ticonderoga of Greenwich was the winner with the American 1925 Herreshoff Schooner Mary Rose taking Class B. However after time correction, Michael Jarrald’s British 66′ Cutter, Lily Maid, built in 1904 was the winner of Class B and the Vintage Classic fleet. Ralph Isham’s timeless American clipper-bowed classic, 105′ ketch Whitehawk revelled in the big breeze and reaching legs to take a great win in Classics Class A and the 17 strong Classic Fleet. 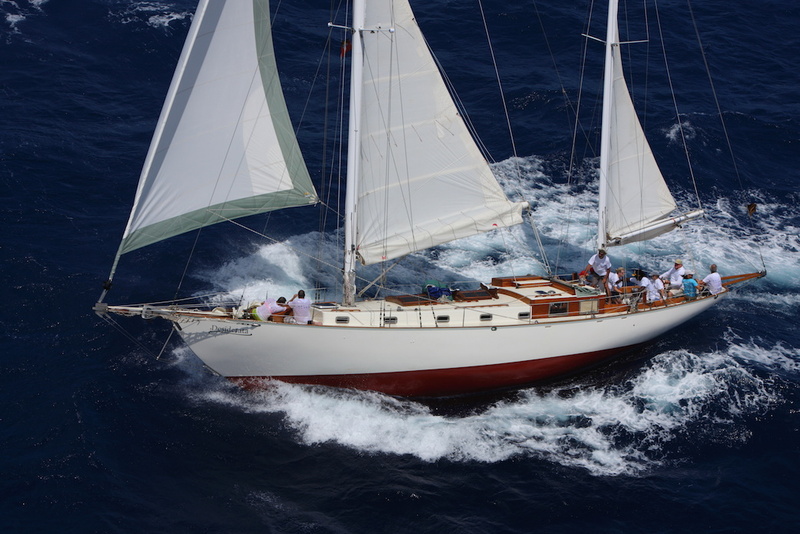 Last year’s class winner, Van de Stadt ketch, Stormvogel was second by just 36 seconds on corrected time. Robert Soros’ Juno was the winner in Classic Class B and Ross Gannon’s Eleda was the winner of Classic Class C. Spirit of Callisto owned by Richard & Linda Hearn won Classic Class D.
In the Classic GRP Fleet, Stuart Armstrong’s John Alden designed Desiderata was the winner, taking Line Honours and the win after time correction. Desiderata was built in 1975 and has sailed around the world. Today, British couple, Stuart and Julia are the proud owners, living happily on board, all year round. Desiderata had an extensive refit in 2013. 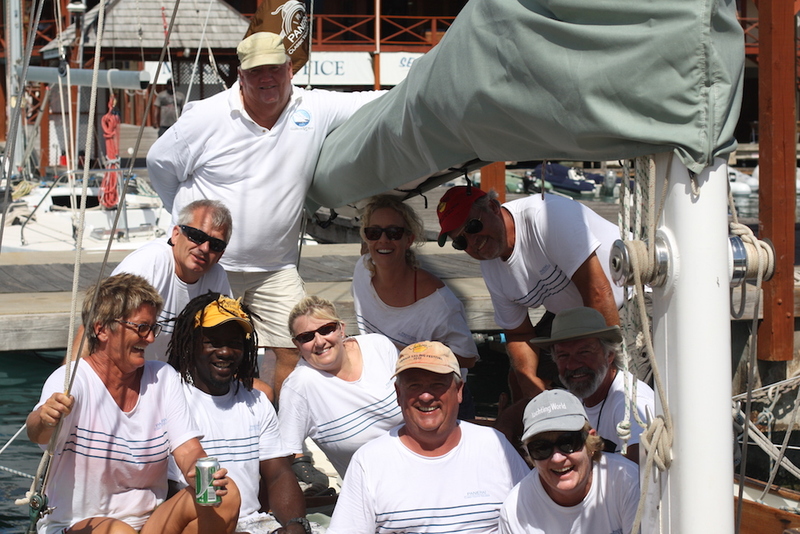 In Classic GRP Class B, Springtide raced by a St.Maarten team, skippered by Robbie Ferron, took the win but only just. Martin Halpern’s Ruffian was less than a minute behind on corrected time. The Alwyn Enoe designed 42′ Carriacou Sloop, Genesis showed a clean pair of heals today in the Traditional Racing Class, taking Line Honours by over 12 minutes and correcting out to win the first race of the regatta. Antiguan Alexis Andrews, skipper of Genesis was dockside in a big huddle of Carriacou Sloop sailors, enjoying a cold drink dockside in Falmouth Marina. In the Spirit of Tradition Class, Michael Hough’s 49′ Chloe Racing Spirit, corrected out to win the race. Classics’ Race Reporter, Louay Habib took a ride on the beautiful J/Class, Rainbow for today’s race. The original Rainbow was launched in 1934, commissioned by Harold Vanderbilt for the America’s Cup. 78 years later the new Rainbow, designed by Dykstra Naval Architects, was launched at Holland Jachtbouw. The latest version has a luxurious mahogany interior, the mast is carbon and Rainbow is bristling with the latest deck systems. In cruising mode, the 130′ J/Class can be sailed by just six people. 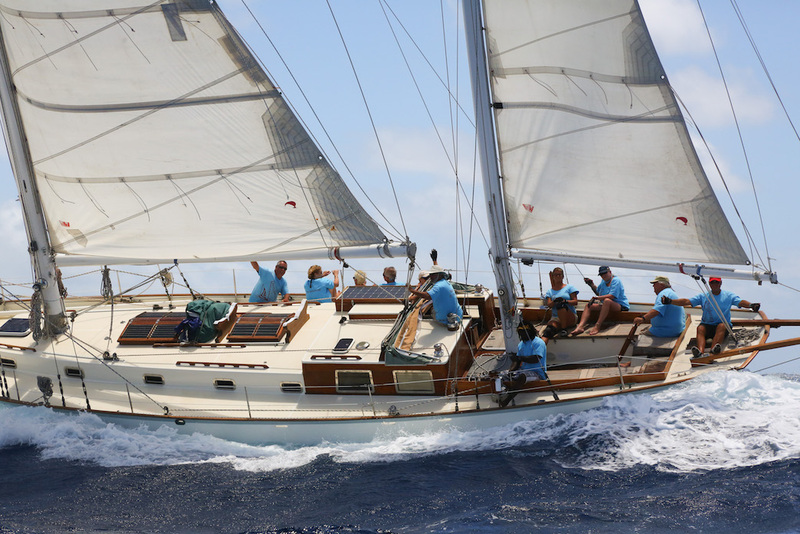 Article from Antigua Classic Yacht Regatta Website. 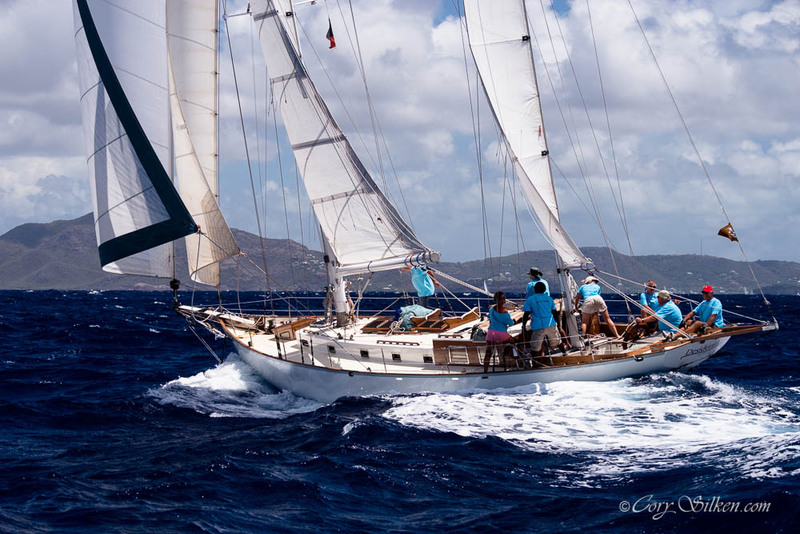 This entry was posted in caribbean, regatta and tagged antigua classic yacht regatta 2014, caribbean classic yacht regatta on April 19, 2014 by sydesiderata.